UK owners of overseas property - a seller’s market? With the fall in the value of sterling following June’s Brexit vote, World First considers some of the options available to UK owners of overseas property. … than if you had sold it this time last year, before the effects of the June referendum. That’s because following the Brexit vote the pound has fallen notably against the dollar and also against the euro, the Swiss franc, Australian dollar and more. In fact, at the beginning of October, GBP was only up year-to-date against six currencies, and this list included the Mozambique metical, the Venezuelan bolivar and the Surinamese dollar. So, what’s happened to sterling? On the day of the EU vote the pound peaked at around 1.46 against the US dollar but has followed a slow and steady downward trend ever since. At the time of writing, sterling was 18% lower against USD than it was the day before the EU Referendum vote and 23% lower than one year ago. Against the euro it was a similar story. The day before the vote, sterling peaked around €1.30 and, the day after, it plunged to around €1.17. It is now around €1.11, about 21% down on this time last year. Does the fall in sterling makes this a seller’s market? Now whilst the fall in the value of sterling is not good news for those who had hoped to buy their dream home in the sun in 2016, it’s an entirely different story if you already own an overseas property and you’re thinking of selling. 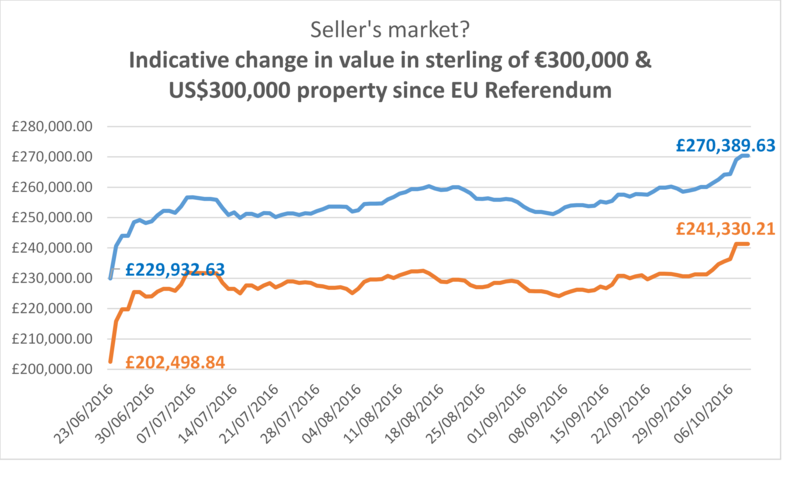 The chart below illustrates just how the indicative value of a €300,000 Spanish villa and a $300,000 US townhouse would have fluctuated since June 23rd, the day of the UK’s EU referendum. Of course, you don’t just have to sell to take advantage of the low value of sterling. You could also consider renting and still enjoy the uplift in your income once you’ve converted your euros or dollars into sterling. Don’t leave it to luck to find out how many pounds you get. Property transactions take time, so there is plenty of scope for sterling to rise and fall if you’re selling. Likewise if you’re renting out a property, then the uplift you’re benefiting from today could be wiped out if sterling strengthens. By using a forward contract, available from World First, vendors and landlords can help manage those currency fluctuations. A forward contract can run for up to three years and allows you to fix a rate at a level which you are comfortable with, and then to budget accordingly. World First offers these at competitive foreign exchange rates, alongside its exceptional customer service. Their dedicated dealing team will talk you through every step of the process.